But if a watered down pathetic bit of health insurance reform legislation might cost $1 trillion over the next ten years then OMG! even chief planet monkey David Kastenbaum says, "I really can't wrap my head around a trillion dollars." He explains that it's "six times NASA's budget..."
At least Linda Wertheimer has the sense to ask, "How would it compare to the Iraq War?" But David's not going down that road and dismisses it with a simple "100 billion a year is roughly, ballpark what we are spending on the Iraq War." God forbid he mention that the old Iraq War will probably cost a bit more than that - at least by a factor of 2 if not 5! As readers have noted, Dean Baker has been an astute critic of NPR's economic monkey business and he has already noted the silliness of NPR's fixation on the figure of a trillion. Got to love the comment under the piece on NPR's website by Madchen Vapid who writes, "Dear Planet Monkey, What does 1 trillion bananas look like?" By my estimate, i f you distributed the 1 trillion bananas evenly over the earth's surface, that would be about 1 banana for every 500 square meters. In other words, if you divided the earth's surface up into a bunch of squares that are about 22.4 meters on a side, that would be 1 banana per square. 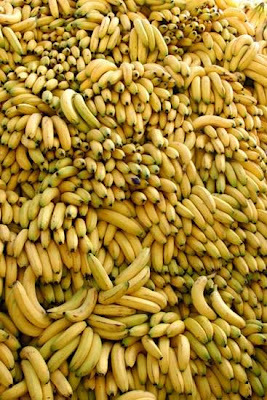 Hey, maybe if we can get people all over the world to distribute all those banana's, we can keep the folks at Planet monkey busy for a while gathering them all up. let's see. If Adam davidson can gather 20 banana's in two hours and david kestenbaum can gather 30 bananas in 2 hours and 15 minutes, how long will it take both of them working together to gather them all up? yeah, that should keep em out of out hair. A much more meaningful comparison for Kestenbaum to have given would have be that $1 trillion is about 8 times what it cost to put men on the moon. That was back in the days when you could actually GET something for your tax dollars. Doesn't David Kestenbaum have a Ph.D. in physics? And he has trouble getting his mind around a trillion of something? I wonder what branch of physics he was in that he didn't have to conceive of quantities on the order of 10^12. Avagadro's number (6.022 x 10^23) must have really stymied him. Kestenbaum may have a PhD in physics but he is not actually doing physics, now is he? But quite apart from that, I seriously doubt that anyone can really fathom a number like Avagadro's number -- probably not even Avagadro. he could calculate it, but I doubt he really had a feel for how big it was, at least not in terms of ordinary experience. That's what's so hard about these big numbers. There is nothing in our daily lives that comes even close. It's actually kind of useless to even try to "understand" what a trillion is. When you are talking that much money, it makes more sense to divide it by the number of people in the US (300 million). $1 trillion is $3333 for ever man woman and child in the US, which gives a much better feel for how it might impact each of us. What family of 4 could not use an extra $13,332? That's essentially what we are talking about foregoing when we throw $1 trillion down a rat hole like the Iraq war. I thought of this while I was ought driving this weekend: The average cost of a new car in 2007 was $28200, so let's say it's not $30000. So 33 cars cost about $1M. So 33 million cars cost $1T. According to Wiki, this is the number of new cars sold in the US in about 2 years. ...oops. Let's say it *is* $30000. Need to use that PREVIEW button more. one thing that strikes me about the "debate" on health care is that you never see any estimates for the actual SAVINGS to the government and economy (eg, worker productivity) by keeping people healthy. My guess is that it is a big chunk of this $100 billion per year cost that we are hearing about from the Monkeys at NPR. Think about. Suppose a person stays home sick from work for a week so that they or one of their children can recover from a bacterial infection that would have cleared up in a day had they been able to afford the trip to the doctor. Suppose that this costs the employer $500. Now, multiply this by 40 million uninsured Americans. That's $20 billion dollars each year. And that's undoubtedly a low estimate because trips to the emergency room for people who do not have health insurance can end up costing the hospitals and government thousands of dollars. People without health insurance put off going to the doctor until they can no longer avoid it which also jacks up the overall cost. These politicians are basically in the back pockets of the insurers but they claim they are working for us. And then you get these clowns on Planet Money wh pretend that they know more than the rest of us about this stuff when they are basically worse than clueless because they too are effectively getting paid by the insurance companies and pharmaceutical companies who are underwriting NPR. it's all a cruel joke.